Available in sizes to fit every horse , it protects your horse’s sensitive eyes from annoying flies, dust, and debris. It also offers a comfortable design that stays in place, thanks to the unique horse-proof Double-Latch Closure. Won't obstruct vision. 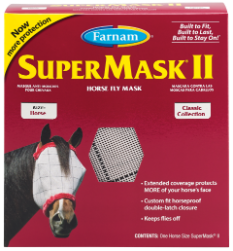 Horseproof Double-Latch Closure provides twice the staying power of other masks. Aids healing after eye injury. Provides maximum comfort with no rubbing or harsh abrasion. Available in sizes: Horse, Arabian, Yearling, and Foal.